Measurements: 2.6 x 4.75 inches, or 66 x 120 mm. Back of card: Blue & white, a field of tiny illustrations of an Egyptian maiden, laid over & over each other like an MC Escher drawing. Technically one side up only, but the card simply looks mottled & you'll have to look closely to tell if the card is inverted or not. Booklet included: Yes, a long folded card with 20 panes. Featured on it is a shortened version of the Celtic layout, using seven cards. 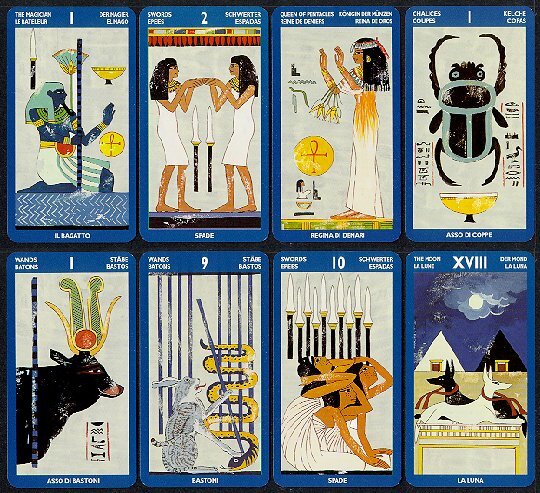 Comments: There seems to be a glut of Egyptian inspired decks on the market. I'm not sure how much of Egypt there is in any of them. The gimmick to this one are white streaks here & there to make us think they're very old. Of course they're not. I was struck by the ten of swords: Three women in tears in a pose that makes me think they're begging for mercy. Above them ten swords, blades up, as if their fates were already sealed. Despite the romance of the Pyramids, ancient Egypt was not so nice a place if you weren't wealthy & powerful. Some wealthy men had more than one wife, which is already not much fun if you happen to be female. And upon their deaths, some wealthy men with more than one wife had them entombed alive. These burials were public ceremonies. The embalmed body was paraded through the streets with the doomed women following behind. The entire town followed them to the mausoleum where the body was placed with care, the women (still living) packed inside, the bricks laid & the tomb sealed. After the closing rituals the crowd dispersed, but if you stayed behind you could hear the women screaming for air for long painful hours afterwards. Here is the most evil part of all: Only some men ordered this to be done, and only some priests would do it even if ordered. So some of the women in the ghastly procession believed they would be spared, based on funerals of lesser men in their town. They walked with their heads up, with a grave & regal bearing. They believed they would be taken aside at the entrance to the tomb, or dug out after a decent interval. The Number One wife in particular. The crowd, of course, knew better. She screamed the loudest, and the longest, as the air gave out and the realization set in, smashing her fingers into bloody stumps clawing at the sealed stone door. I'm sorry to have written the story. I saw this happen long ago in Egypt & many lifetimes later met the Number One wife in question & relived it all over again. I'm not sure the story should be told & I'm not sure it shouldn't. Such is the power of a card in a deck.